Each of my parents grandchildren has a special Star on the maternity ward wall at our hospital. 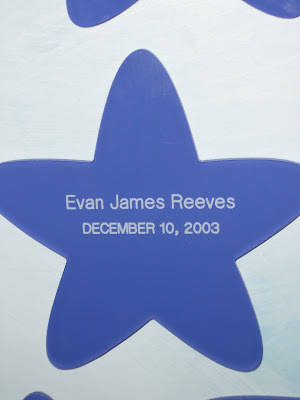 The hospital invites you to make a donation to the hospital by purchasing a "star" with your newborn's name on it. My parents have made it a tradition to get one for each of the kids in the family. 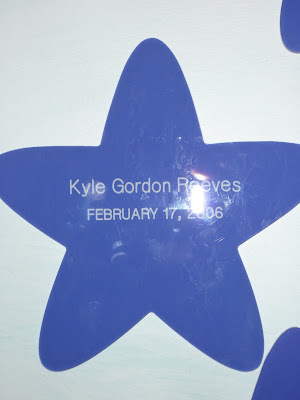 Just recently, I was back at the hospital and found all of the stars... (Maddie's isn't up yet) and took some photos. What makes Nicholas' extra special is that he wasn't actually born at this particular hospital, although he was supposed to be. The following is a letter that was published in the hospital's monthly magazine. On November 7, 2008, our grandson, Nicholas Warren Reeves was born at Mount Sinai Hospital in Toronto to our daughter, Leann and husband, Jim Reeves. Unfortunately, Nicholas did not survive the delivery and joins those who are waiting for us all. Leanna and Jim have two very healthy and active boys, Evan James, 5 and Kyle Gordon, 3. Both boys were born at Southlake and proudly display their "stars" on the wall in the maternity ward along with their cousins. 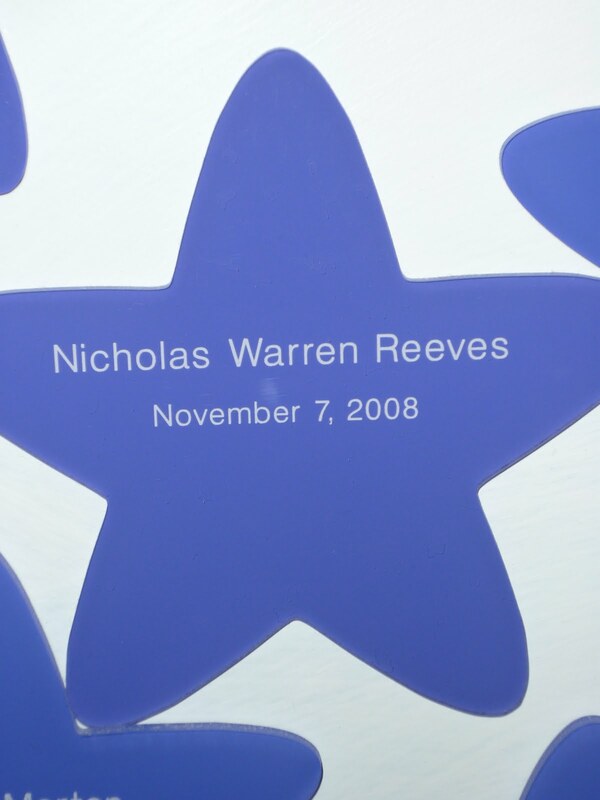 Our heart felt thanks go to Southlake Regional Health Center Foundation for allowing us to donate a "star" in memory of Nicholas who was scheduled to be born at Southlake and now joins his brothers and cousins on the "baby star" wall. I think that, (a) it is wonderful that the hospital has such a lovely tribute, and (b) that Nicholas has such wonderful grandparents who love him. I'm so glad that they did that for Nicholas. So very special for your family. That is so sweet... Tears falling freely... What special grandparents Nicholas and your children have. Where is Nicholas's star? My best friend got one for Jackson - I look at it with love every time I go past! What a beautiful image. And how totally right that he should be with his brothers. He was a gorgeous boy. I am so sorry he isn't here with you. I'm glad that Nicholas has a star on the wall too. That is very moving...Thank you Lea.